Take one underperforming super-luxury car brand, create an eye-catching design study with historical significance, and watch the world's ultra-rich flock to its contracting sales network. It's not as easy as that, but Maybach's not giving up without a fight. Thus, the Daimler brand's designers have created this one-off Landaulet concept as an homage to landaulets past. That means the roof over the passenger compartment slides back, revealing the sky to the beluga-addled captain of industry within. Look for it at the Dubai motor show this month, natch. 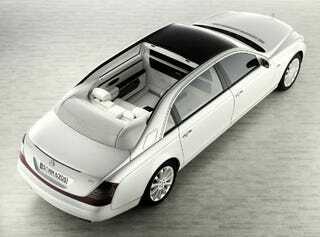 With this study of an open-top landaulet, Maybach has re-enlivened the great art of building majestic automobiles. True to the tradition of exclusive landaulets, the roof of this sparkling white one-off study can be opened fully at the rear, while the chauffeur's compartment remains completely enclosed. The passengers are then able to enjoy the clear, blue sky above. Seated in opulent armchairs upholstered in white leather, they are treated to a majestic open-air experience currently unrivaled by any other automobile in an environment of the utmost luxury and exquisite style. Romance close to the heart of nature is harmoniously combined with the ultimate in comfort and technological sophistication. With this unique study, Maybach is once again demonstrating its expertise in building the world's most exclusive luxury cars. In technical terms the Landaulet study is based on the Maybach 62 S - which can claim to be the world's most powerful series-produced chauffeured saloon. Maybach technicians have removed the rear roof module in order to afford passengers an unobstructed view of the sky above. The side walls remain, and have merely been invisibly reinforced with an integral tubular steel structure. As these measures have not altered the silhouette of the luxury saloon, the generously dimensioned doors and the complete interior with its reclining seats remain unchanged. When closed the black soft-top of the Landaulet rests on the frame formed by the roof bows, and is wind and weather-proof. When requested by the passengers, the chauffeur operates a switch in the centre console. The roof then opens electro-hydraulically and is gently deposited on the parcel shelf in the rear, together with its integral rear window of single-layer safety glass. Opening and closing the roof takes 16 seconds. The chauffeur is able to enclose the folded roof with a fitted leather cover, which both conceals the roof mechanism from view and completes the overall picture of outstanding elegance. This impression is accentuated by the shining white paintwork of the study, an exclusive finish named antigua white. Visual highlights are provided by 20-inch wheels specially designed for the Landaulet study. These are also painted in white with high-sheen spokes, and are accompanied by white indicators in the front and rear light clusters in dark red. In addition, the already luxurious driver's compartment of the successful Maybach 62 S has been enhanced in a number of important respects. All the interior trim is now surfaced in black piano lacquer, and for the extensive leather appointments Maybach has used particularly exclusive, glossy Stromboli black leather. In contrast Maybach has fitted the passenger compartment almost completely in exquisite Seychelles white leather. The footwell and roof liner of this high-end luxury landaulet are also in white - the floor is carpeted in white velour and the roof lined with white fabric. A dramatic contrast is provided by inserts and decorative trim in glossy, black piano lacquer or exclusive black granite with numerous gold inclusions. Outstanding comfort is assured by the generous spaciousness of the rear, which the Landaulet study has adopted unchanged from the Maybach 62. Passengers are welcomed into the interior by two large, single seats. These elegant seats also allow even very tall passengers to enjoy a reclining position which travellers normally only encounter in the first-class armchairs of modern passenger jets. The study is designed as a chauffeured vehicle and features a partition. The upper section of the partition is a glass panel which the passengers can render opaque at the touch of a button, thanks to a liquid crystal membrane embedded in the glass. Two ultra-modern automatic climate control systems, whose parameters have been adapted to the Landaulet study, ensure that open-air travel remains a pleasure even under adverse climatic conditions. As in the Maybach 62 S, the rear console is the centrepiece for entertainment, communications and travelling pleasure. This is where Maybach engineers have grouped everything relating to the entertainment and pleasure of the rear-seat passengers: a DVD-player, six CD-changer, a cooler compartment with its own electric compressor and an intelligent system which holds glasses, goblets and champagne bottles safely in position. The Maybach Landaulet study is powered by the uprated V12 engine which Maybach engineers have developed further for the Maybach 57 S and Maybach 62 S together with the specialists at Mercedes-AMG. Thanks to twin turbochargers and water intercooling, the V12 develops a maximum output of 450 kW/612 hp from a displacement of 5980 cubic centimetres. This is continuously available between 4800 and 5100 rpm, and the engine also delivers an impressive maximum torque of 1000 newton metres between 2000 and 4000 rpm. The electronically controlled air suspension AIRMATIC DC (Dual Control) and the Adaptive Damping System (ADS II) endow the Landaulet with outstanding levels of ride comfort, at the same time demonstrating that even a prestigious vehicle such as this can exhibit extraordinary agility and dynamic performance. In addition to large, internally ventilated brake discs - with twin callipers at the front - both the study and the Maybach 62 S are equipped with two electro-hydraulic Sensotronic Brake Control (SBC™) braking systems working in tandem. Together with ESP®, ASR, ABS and Brake Assist, this provides the Landaulet study with the very latest in effective, high-tech handling control systems. Like all Maybach saloons, the Landaulet also benefits from the unrivalled experience of the sister-brand Mercedes-Benz in the development and production of high-quality cars in the luxury segment. Important innovations from Mercedes-Benz, successfully developed further for the Maybach saloons, are standard equipment in every Maybach and are of course also on board the Landaulet study - examples include the electronically controlled air suspension AIRMATIC DC (Dual Control), LINGUATRONIC voice control and the control and display system COMAND APS.